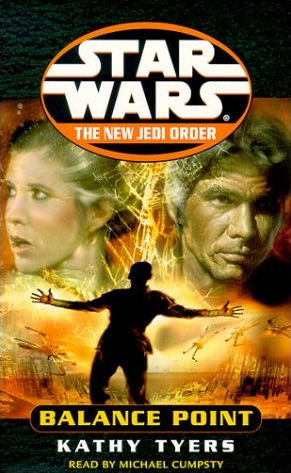 Continuing on with the New Jedi Order saga, the Yuuzhan Vong continue with their terror campaign to conquer the New Republic and shape the galaxy for their own purposes. And the New Republic is having a dickens of a time trying to hold things together. The refugees from the previous novel have been relocated to Duro, a planet essentially dead after centuries of over-industrialization, in an effort to fix things up and make it their new home. A few throw pillows here, some new curtains and a few dozen air fresheners to make the smog-poisoned air breathable, and good as new. Only, things are going about as well as you would think when you cram several hundred thousand displaced beings from multiple worlds and species under several large inverted Tupperware bowls, with a shortage of supplies and what I can only imagine is a big stench from not being able to shower. Add to this volatile melting pot a Yuuzhan Vong infiltrator stirring things up, Jacen (the whiney emo of the Solo children) deciding to give up using the Force entirely because of a dream he had, Mara and Luke finding out there’s another Skywalker on the way, and the so-called Peace Brigade and Duro officials about to betray the planet to Yuuzhan Vong invaders–who have now got a serious mad-on against the Jedi–and you’ve got another greatly amusing episode in this ongoing saga. Author Kathy Tyers did well in keeping the story going along at a good clip, making even the moments of intimate interaction between the family members not as cheesy as they could have been. Also, lil’ Baby Skywalker’s a-comin’! But anyway, yeah, I’m familiar with Ms. Tyers’ Star Wars work by way of the short stories she’s done for a couple of anthology collections. As for Balance Point, it furthers the overall New Jedi Order arc well, and has a couple of surprises, and was well written with the action and requisite intrigue. Not the greatest entry in the New Jedi Order, but far from the worst, I think.